Eating meals used to be so simple. You fix a romantic dinner for two, or you quickly go grab a meal for yourself, to eat while you watch the game. The hardest part about dinner used to be choosing what to eat. Now it’s choosing whether to change your kid’s clothes to the ones that can be thrown away afterwards, or just stripping them naked to throw directly into the shower afterwards. Don’t get me wrong; as a parent mealtime isn’t bad now, it’s just different. Kids change your life in innumerable ways. This change can be good most of the time. The rest of the time it’s…challenging. Mealtime can go either way! 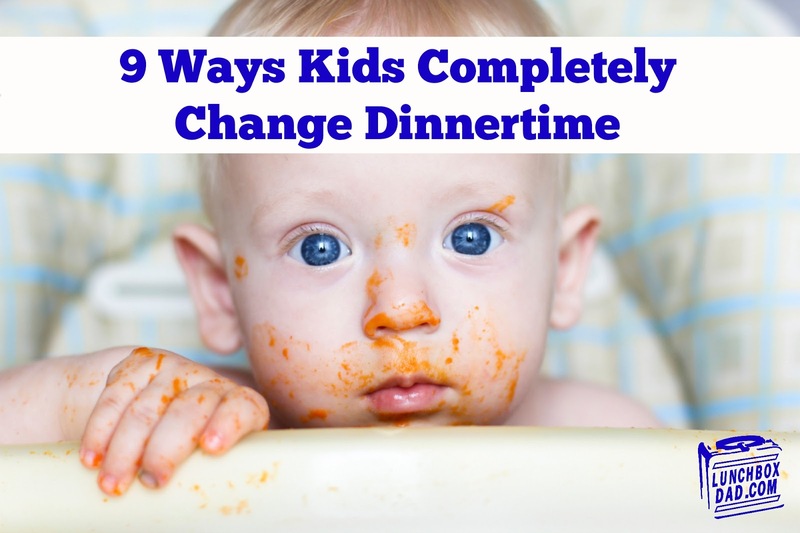 Here is my list of how mealtime completely changes when kids become part of your family. 1. You learn to eat one handed. When you have a baby, you should get a Ph.D. in doing things one-handed. You find out you didn’t really need that other hand anyway. Serving the food with one hand? Easy. Pouring drinks? Simple. Cutting steak? C'mon, give me something difficult. With a little practice, parents are magicians with that one hand. In between having babies you don’t lose this skill either, it just goes into hibernation and comes out again when it’s needed. 2. You wish someone would invent seat belts for the dining room table. How has someone not thought of this already? We can put a man on the moon but we can’t figure out a way to strap a 6-year-old to their dinner chair? Kids act like you make them sit on nails when they are at the dinner table. Partly it’s just the 45 times they need to go to the bathroom, but the other times seem to be an involuntary reaction to vegetables, little brothers, or both. 3. Finding a Kids Eat Free place is like winning the lottery. Before kids, I didn’t think “Kids Eat Free” coupons were worth the paper they were printed on. Now, I wouldn’t trade them for getting “Let It Go” banned in the United States (although it’s tempting). The beauty of eating at restaurants that give out these coupons is that not only do kids eat free, but you also don’t have to clean up the mess on the floor! This benefit alone automatically triples what the coupon is worth. 4. Chicken Nuggets are a food group. You try and make balanced meals, but honestly many parents always keep frozen nuggets in their freezer for backup. Nuggets are like the first aid kit of the kitchen. Dinner goes wrong. You have nuggets. Kid’s friends stop by unexpectedly? Nuggets to the rescue. Nothing like breaded chicken…um pork…uh turkey? It doesn’t really matter what that meat is, if this is the first time your child has eaten more than two bites at a meal in three days, you are not complaining. 5. Dogs are basically vacuum cleaners. Remember when your dog used to be you and your spouse’s prized possession? You would go dog treat shopping, and buy it that special collar. Now the dog is 10 pounds overweight because the mounds of food the kids feed him. After your children are done with dinner, there might be a whole meal in scraps under that table. Dogs are now more than man’s best friend, they are every parent’s best cleaning appliance. 6. Who needs napkins when you have sleeves? No matter how many times you tell kids not to, or how many stacks of napkins you pile in front of their plates, a sleeve always get used. Ok, maybe not every meal, but every single time you serve fried chicken or spaghetti. When drinking water or eating Saltines they will use every napkin in the house to clean themselves up instead. 7. Dirty dishes seem to multiply like rabbits. Parents, how many times have you looked around after the meal and wondered where all those extra dishes came from? Some of them you don’t even recognize as yours. Since when did mac and cheese require you to use 22 plates, 17 bowls, and 8 spatulas? You don’t know how, it just happens. Like how Lego bricks transform into deadly weapons that attack parent’s bare feet at night, it’s unexplainable. 8. It’s against the law for a parent to have a “hot” meal. Remember that scene from the movie A Christmas Story when Ralphie states that his mother hadn’t had a hot meal for herself in 15 years? Before you were a parent, you laughed at how far-fetched that line was. You’re not laughing now, are you? Between getting all the kids second helpings, extra ketchup, rags for spills, and cutting up their meat, your hot meal never stood a chance. 9. Meals with your kids can be your favorite time of the day. Even after all of this craziness that that happens at dinnertime, it can still be one of my favorite times of the day. Why? I get to sit down with my family listen to them talk about their favorite moments and their biggest challenges. This is family time. In our busy culture we don’t get enough of it and you can’t buy an experience like a good family meal. Meals like these are memories that last a lifetime in our family, and I wouldn’t trade them for all the quiet, clean, hot meals in the world. Good stuff here. I especially can appreciate number 4. My kids have such a limited diet. I think they even went through a phase where they didn't like chicken nuggets. That has to be against the law - doesn't it? Larry, if it isn't against the law, it should be! Thanks for reading.